The manager and his management team must have considered many permutations before they elected to add Chalmers and Ainsworth to the team to compensate for the missing pair that had served so well in recent matches. 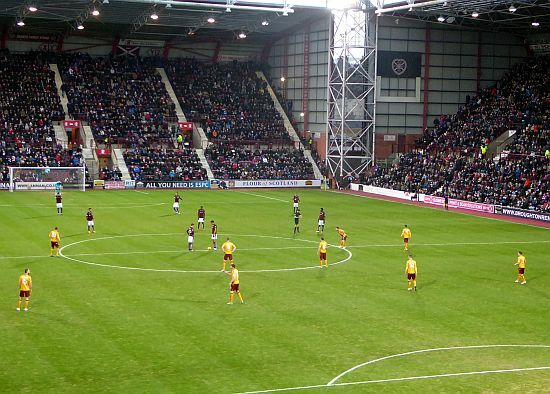 There’s no guarantee that any other replacements would have delivered a better result but we can agree that the changes failed to offer much resistance to a decent Hearts side. Let's hope that's the last we see of that line up. When the team took shape at kick off there was a surprise in store. In addition to the expected disruption in the middle we had the rare sight of Hammell at right back. It is no criticism of our reliable number 3 to admit that he is only half the player when circumstances force him to play on the opposite flank. As a result we had to face Hearts with both ranks in an unfamiliar shuffle. The manager’s post-match criticism of a “lack of energy and determination” seemed harsh. With so many players in unfamiliar roles it was inevitable that the good understanding shown in recent weeks would be missing. To add to the misery our forwards all failed to capitalise on their chances. Ainsworth had a clear shot but no power, Moult headed over the bar from close range, McDonald missed the target with a back post header and Fletcher blew the chance of late compensation when he failed to beat Alexander when he broke into the box. A further twist is that we collected five yellow cards. We’ll soon pay the penalty of further suspensions and Hammell, Lasley, Law, McManus, Moult and Pearson are all close to the six booking limit. The struggle to pull clear of the play-off spot will continue next week when Ross County come to Fir Park. We’ll have to hope that the return of the captain can restore us to the confident team that delivered eleven points from fifteen over the festive period.